Why Should You Need To Stabilize Wood? Wood is a material that is natural, so it can change over time. It can warp or change in different ways which all depend on the environment the wood is in. Therefore, learning how to stabilize wood is important. The wood becomes more compact because the air pockets are shifted throughout. When you stabilize wood, you reinforce it to make it more durable or to cover any defects it has. Aside from making it stronger, stabilizing wood also makes the wood ready for polishing and production of items such as gun handle, knife handle, and furniture. Stabilizing wood is not difficult with the right wood stabilizing equipment. Here are some wood stabilizing supplies to help you set up your own wood stabilizing system. This device draws the air out from the wood. It can affect the finished product, so you should assess the right vacuum pump for stabilizing wood. You can either utilize a hand operated vacuum or a service vacuum pump with air conditioning. Your goal is to have about 25" to 30" of mercury. A vacuum chamber is easy to acquire since it is just a container with a lid such as a pickle jar. This is where the resin and some pieces of wood are placed. The lid should be fastened and a vacuum pump should be connected to it. This tool is a homemade wood stabilizer you can make. The resin is the star of wood stabilization. Most people use Minwax Wood Hardener. It is a solution that dries quickly and strengthens decaying or rotting wood. This wood hardener’s ingredients are acetone and methanol. There is also a way on how to stabilize wood with acrylic. One way is by stabilizing wood with Cactus Juice. Cactus Juice wood stabilizer review states that this is highly recommended since it is vacuum pump friendly. Some other products you can try are Resinol 90c and Pentacryl. If you are on a tight budget, a DIY wood stabilizer can be created in your house. You are probably surprised to find a kitchen appliance on this list. It will be used to heat the wood before the process of stabilizing it. In addition, curing the resin will also be done here. Any oven will do, but a toaster oven will give you more control over heat. 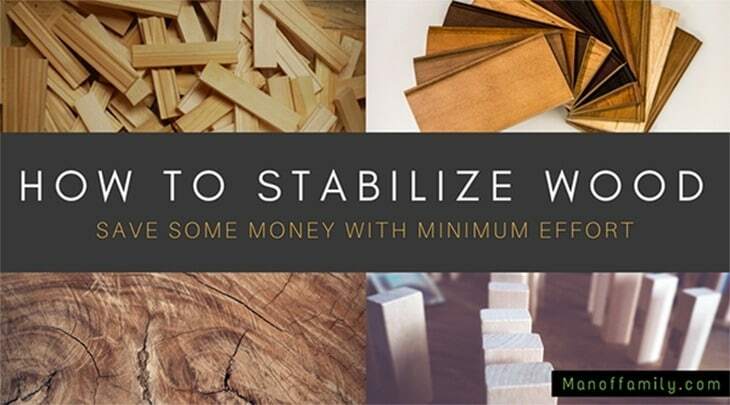 Now that you have the things you need, you can do these steps on how to stabilize wood at home. First, wood blanks have to be completely dry. If they are wet, you will fail in stabilizing the wood. You can check the moisture of the wood by using a moisture meter. The moisture level should be less than 10%. Cut your wood blanks roughly into slightly big pieces and place them on a rack or an oven so that they will dry more quickly and air can flow on all the sides. Tips: You have to be patient in drying them, and you have to handle them carefully. If not, they will crack. Then, put them in a bag that is sealed tightly before stabilizing. If you want to personalize your wood blanks, you can use dye. For a brighter hue, add more dye to your blanks. Prepare a vacuum chamber. Put the blanks inside this chamber. Tips: You also need to place an anti-float plate in order to submerge the blanks completely in resin; thus, avoiding it to float throughout the procedure. Pour down the resin solution into the chamber. Make sure it is at least one inch above the blanks so that they will be soaked completely. The resin can be used repeatedly, so there will be no waste. If you want color, blend the dye of your choice to the resin. Shut the chamber and connect it to the vacuum.Do not worry about the foam forming in the chamber. This occurs due to the air being pulled out from the blanks. Use the vacuum until you do not see any bubbles in the chamber. You can control it through its valve. Leave the blanks submerged in the resin for about an hour after using the vacuum. Then, you can remove the lid. Floating wood blanks mean you have to do the procedure all over again. You can remove the wood blanks from the chamber if they did not float. Remove extra resin by wiping it off. Rinse your chamber and wood stabilizing kit as soon as possible. You have to use aluminum foil to wrap your wood blanks individually and put them in an oven that is pre-heated to 200 degrees Fahrenheit. Blanks with a size similar to a pen take only about 30 minutes. For bigger blanks, it takes more time. An oven thermometer can be used to check for the temperature. If the amount of heat is not accurate, the process of curing will fail. The final product should be hard and crystal like. Return the blanks into the oven if the resin is wet. If they are done, wait for 1 to 2 days before turning. The above process, I shared with you how to stabilizer wood using the resin. If you do not have the resin, don't worry, I will share you some other ways to stabilizer wood. Let's go! If you have the old and crumbling wood, you can apply this way to stabilizer wood. At first, sand off the surface of the wood that may have signs of decay. Next, make sure that your wood is dry enough to proceed with the stabilization process. Final step - Apply the wood hardener (using a brush). Allow it from 2-4 hours to dry. How many coats depends on preference. If you like another way using natural ingredients than chemicals to stabilize wood, this method is for you. Like other ways, always keep your wood dry. You need a mixture of three pounds and one gallon of water. And then, add in some cups of cornstarch until the consistency becoming pasty. The last step, separate three eggs and add in the egg whites into your mixture. Use a brush to apply to your wood with the above mixture. Let it dry in a low humidity room for several days or weeks so it can cure thoroughly. Put your dry pieces of wood in a soaking pool. Make sure the container large enough to hold your wood pieces without touching any sides of it. You can use two small wood planks as jigs to make sure your wood pieces do not touch the bottom of the container. Next step, Pour Pentacryl over your wood pieces. You can use the brush for any larger piece of Pentacryl on top of the wood. Afterward, cover it with plastic to start the curing process. You need the wood to soak Pentacryl from three days to a week for the best result. Once Pentacryl is fully absorbed, move your wood pieces in a room without direct sunlight and let it dry for another eight weeks. The process on how to stabilize wood is not hard. A first timer can successfully do it just by following the steps given. The tools needed are easy to find. You can even make some of them in the comfort of your own home. You just need to be wary of immersing the wood blanks in resin and curing them in order to avoid unwanted result. What do you think about this? Give your ideas in the comment section. If you like what you just read, please share this article. How To Cut Formica With A Utility Knife? How to Cut Galvanized Steel Pipe?